Five years ago, my brother gave me a box of 3.5″ and 6″ squares cut from vintage Hawaiian shirt fabric and asked me to make a quilt. I found the perfect pattern in the ScrapTherapy book by Joan Ford. I’ve worked on it off and on for the past few years, and finally finished it! 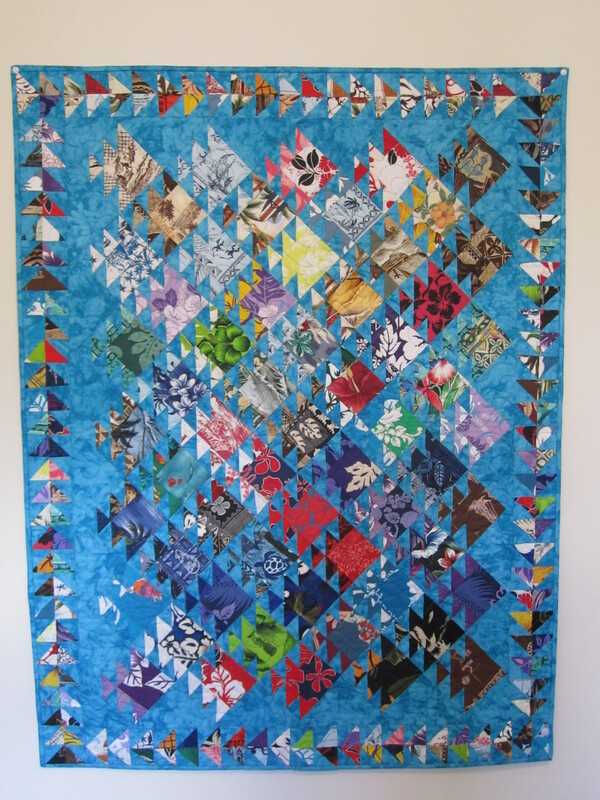 This quilt has over 1,000 separate pieces and lots of triangles. I tried to set up somewhat of an assembly line to sew and trim the half-square triangles. Every few months, I would pull out the project and do a few more half-square triangles. The best part was figuring out which squares to pair with the half-square triangles in order to make the fish. I think the fish turned out great and I really like how the blue fabric makes them pop! What long-term project have you finally finished? Comment below! This entry was posted in Fabric, Quilting, Stashbusters. Bookmark the permalink. I can honestly say, I saw the finished product in person and it is truly the most beautiful quilt and the workmanship is perfect. Thank you! I am very happy with how it turned out when it was quilted and bound. So nice to see you blogging after a long absence! I love how you have a shadow block second row from the bottom left that looks like one of the fish broke ranks and darted off! Last week I finished a project that I started in March 2013 at a guild workshop. Had lots of fun machine quilting it, so satisfying to know I’m not alone with OFO’s! Opps, read the link on my blog as 11 hours, not 11 months…hope all is well with you. All is well here. I haven’t had much time to blog, but I have been finishing some projects. I should post some of them!